Just listed - this beautiful used 90' Hargrave yacht for sale! 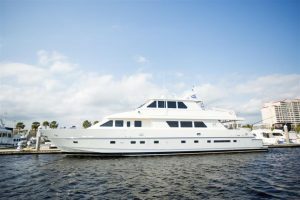 : Atlantic Yacht & Ship, Inc.
Word just came in from Chris Carroll that he has listed a deal on a used 90′ Hargrave yacht for sale in Myrtle Beach! In the first place, the expansive interior of this used 90′ Hargrave yacht, known as “Common Cents,” emits the perception that you are on a much larger vessel. Further more, herr luxurious 4 guest stateroom plus 1 crew layout is extremely accommodating for her guests. She could even be considered a 5 stateroom vessel for an owner/operator. Moreover, she is fully stabilized with over-sized fins and has 2800 original hours on her Caterpillar engines. As can be seen, this used 90′ Hargrave has recently had all services and is ready to cruise. Upgrades (2014/ 2015) include audio visual equipment, fresh bottom paint, and brand new air conditioning (new chillers and returns). Furthermore, the carpeting, blinds, couch and chair coverings, granite counter tops and appliances in galley are all new. This used 90′ Hargrave just completed a 4 step polish job to the entire exterior so her hull is glistening! For more information on this beautiful used 90′ Hargrave yacht for sale in Myrtle Beach be sure to contact Chris Carroll today!